To get started log in using your email and password associated with your account. in capture mode. 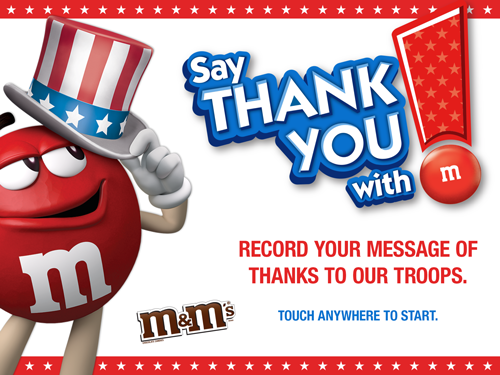 In this case there is only one campaign, 'Thank You Kiosk'. when the app is asleep or waiting for the next guest. can be custom set. The default is 3 frames, 2 seconds apart from one another. Also note on this capture screen your custom overlay will show up as mirrored. the overlay will be unmirrored. 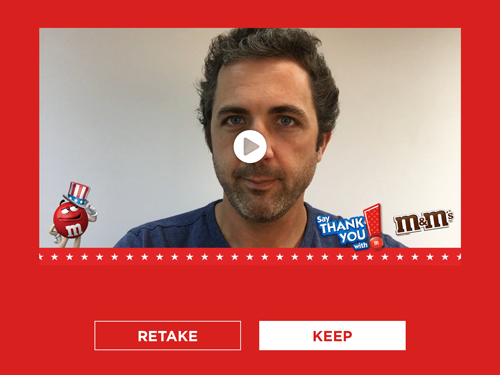 After capture the user will be prompted with a review and the option to RETAKE. 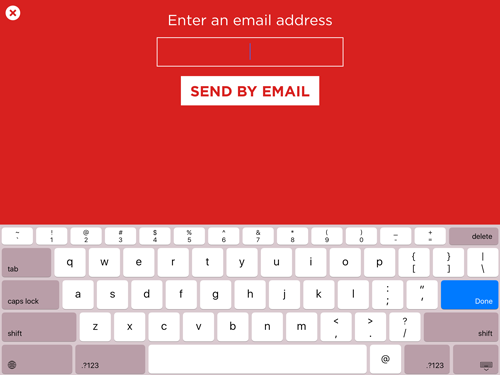 If KEEP is chosen, the user can then share via email or sms or click 'DONE'. 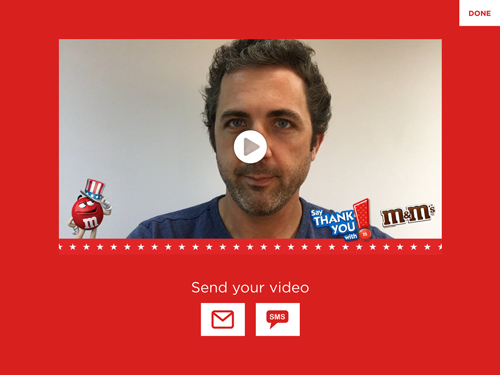 If DONE is clicked without sharing, the media will still upload to your campaign. the app will reset itself after 30 seconds of inactivity. brands use this screen as an age gate for those over 13, 18 or 21. 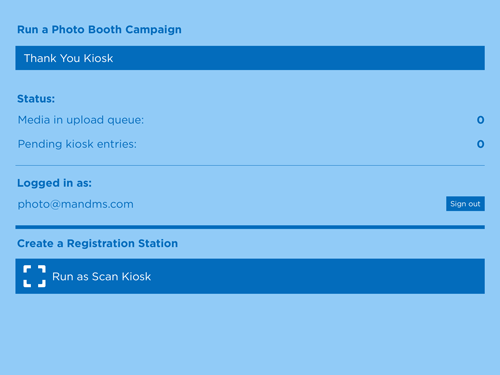 -Sharing options include SMS, Email, Survey, QR Code scanning and Printing. the language of the device under the iPad's Settings > General > Language & Region. button on the iPad and swiping the app up) and relaunch it. 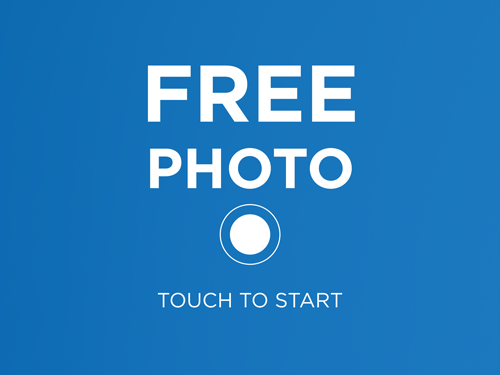 -To customize your version of the Fotozap Booth app please contact us. -You must be connected to WIFI or a cellular connection for your media to upload. log in at http://my.fotozap.com to see the media and associated data. 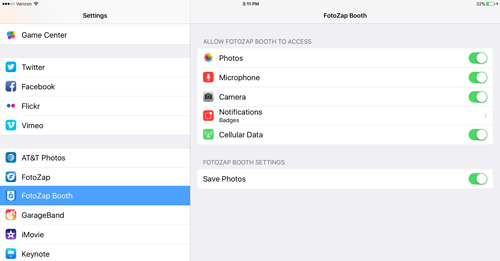 to the device, you can update these settings in the iPads Settings under Fotozap Booth.